While listening to the "In Our Time" podcast recently with some friends, specifically the "Random and Pseudorandom" episode, the topic of predestination vs. free will came up. I made the statement that, as a Christian, I don't think anything is truly random - God created everything with, and for, a purpose. Just because we can't see a pattern or logic in something doesn't mean that it doesn't exist. Take Pi for example; the podcast discussed whether the digits of Pi are random, saying that it is likely they are as we can't find any pattern or logic to them. But unless we possess infinite knowledge, we can't possibly know whether the digits will repeat eventually, or if they follow some logical formula we haven't discovered. My point was that as humans our brain power is very limited and so we can't possibly know if something is truly random or not. This topic led onto the discussion of predestination vs. free will. I shared with my friends my thoughts on the subject and will relay them here for others' benefit. Hopefully it will help you start to understand some of these issues and give you a greater respect for your Creator. Disclaimer: I'm not a theologian or a scientist or any of those other things that might give me a higher understanding of these topics. This is purely a simple explanation of my beliefs. Assume that we have free will, then imagine that our lives are books. When we are born, our book is empty; it's ready to be written in as we freely live out our lives. When we are faced with a choice and make a decision (exercising our free will), our decision is written in the book. It can't be changed thereafter as we are constrained by time and cannot change past decisions. When we die, our book is complete. It serves as a record of everything we did in life; the decisions we faced and the actions we took. Now factor in God. God exists outside of time and is not constrained by it. As we live out our lives He is with us, reading our book. When we make a decision and it is recorded in our book, God sees that. When we die and our book is complete, God is there, having read everything in our book, knowing all the decisions we made throughout our life. Now because God exists outside of time, He can travel 'back in time' (so to speak) to when we were first born. He knows what will happen in our lives as He has read the finished book. When we are faced with a decision, He knows what we will decide; He's already read that chapter. Here is the key: just because God knows what we will do, doesn't mean in any way that we have to do it. We had free will when our book was being written a few paragraphs ago, we still have free will now. Think of it like this; God knows what we've done, it's all past tense to Him. I think the thing that people get confused about is the concept of time, or rather God's lack of it. We cannot comprehend existing outside of time because everything we know (other than God) exists within the constraints of time. Our closest comprehension of existing outside of time is travelling through it, and that's why I used that analogy above with God reading our book - it's the only way we can begin to understand the concept. As with the point I made about randomness above, just because we can't comprehend, understand or calculate something doesn't mean it isn't so. 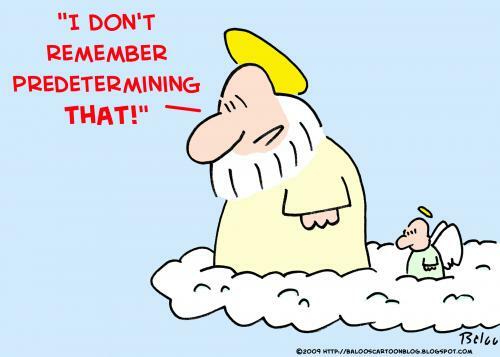 God can still be all-knowing while we still have free will.